About – KRICK LOG ROLLING | LET'S ROLL! 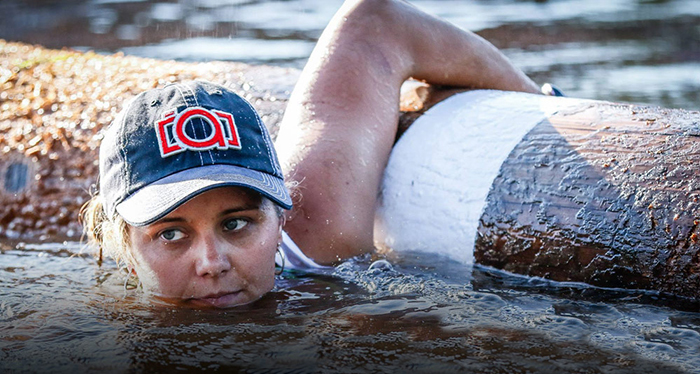 Katherine R. Rick has been among the most accomplished contributors connected to the sport of log rolling over the past 16 years, working as a professional log rolling promoter, coach, and competing as a professional log roller as well during that time. The Onalaska, WI native is also currently an Associate Lecturer of Accountancy at the University of Wisconsin Green Bay and is a Certified Public Accountant. Rick’s first venture into promoting tournaments came in 2008 when she co-founded Three Rivers Roleo, which eventually grew into one of the top three professional tournaments in the sport. In 2015, the Roleo had the second highest purse on the professional circuit and attracted virtually every top 10 pro in the world. Three Rivers Roleo celebrates its 11th year, the weekend of July 14 & 15. The event was broadcast in several states on Fox Sports North, covering much of the upper Midwest. Rick, who’s also directed several amateur tournaments, recently founded the US Logrolling Open, a pro event which will made its debut in Chicago Southland in June of 2016. The third annual US Log Rolling Open will be held in Gladstone, MI, on July 4, 2018. The majority of top 10 professional competitors on both the men’s and women’s side are expected to attend both events. This year’s Open will be co-directed with Dan McDonough, a 9 time log rolling World Champion. Rick has also produced a stellar resume as a competitor in the world of Timber Sports. Over the past decade, Rick has qualified for the STIHL Timbersports series seven times and qualified for ESPN’s Great Outdoor games as well. She’s consistently been among the top Log Rollers in the world since 2005, earning 13 top 3 finishes during that stretch. Additionally, she is a professional boom runner and for the second consecutive year is ranked 2nd in the World.